What Exactly Is Vladimir Putin's Net Worth? Is He The Richest Person On The Planet? Russian President Vladimir Putin's net worth is one of the biggest mysteries of our time. He doesn't divulge it. Russia is extremely secretive about it, but many speculate that he is the richest person on the planet. Why? Well, he lives in a $1 billion palace and owns a $500 million yacht. Those two things alone point to a net worth far higher than we at Celebrity Net Worth or any other outlet or publication estimate. However, if you ask the Kremlin, you are told that Putin earns about $133,000 a year as President and lives in a very small apartment in Moscow. Hmmmm. That info doesn't match what every other account of Putin's lifestyle and net worth is. Stanislav Belkovsky is a former Russian government advisor. He has estimated from his up close time around the Kremlin and Putin that the President's net worth is more like $70 billion. Belkovsky estimated in 2007 that Putin had $40 billion hidden away in Switzerland and Liechtenstein. Belkovsky also claimed that Putin secretly controlled 37% and 4.5% of the two biggest Russian oil companies, Surgutneftegaz and Gazprom. He is also rumored to control at least 75% of Swiss oil company Guvnor, a fact that Guvnor denies. Bill Browder, the hedge fund manager who was the driving force behind the 2012 Russian sanctions that are known as the Magnitsky Act and author of the tell all book Red Notice, claims Putin's net worth is roughly $200 billion. Browder is the founder of Hermitage Capital, the fund that the Kremlin ravaged and led to the death of Browder's friend Sergio Magnitsky under mysterious circumstances. Browder is a longtime critic of Putin. His $200 billion estimate of Putin's net worth would make him the richest man in the world by nearly $100 billion. Still, there is no hard and fast way to nail down just exactly how much the elusive fortune of Vladimir Putin is worth. The 2015 Panama Papers revealed bits and pieces of his fortune, such as the fact that he hides and grows his fortune through proxies. Let's take a look at some clues from the Panama Papers and other sources that point to Putin having if not the highest net worth in the world, one of the highest. As Russia's President, Putin's official place of residence is the Kremlin. However, he actually spends more of his time at a government residence in the suburbs of Moscow called Novo-Ogaryovo. Rumors has it that he has access to 20 different palaces and villas. This is in direct conflict with official Kremlin records from 2016 that state that Putin has very limited real estate holdings that include a simple apartment with a garage and a small plot of land. The Kremlin's official statements on Putin's net worth are at odds with what the public knows. Putin built what is called his "secret palace" for $1 billion reportedly built for him by using illegal funds. Photos of this residence leaked in 2011 and revealed a helicopter landing pad big enough for three helicopters, art lining the walls and ceilings to rival the Vatican, and grandiose living quarters that would make President Trump's fetish for gold plating look like a pauper's home. In 2012, Putin critic and opposition leader, Boris Nemtsov, published a dossier that claimed that Putin owned multiple private jets, helicopters, and yachts. He also claimed that nine of the 20 state residences Putin has access to have been built during his presidency. Yet another source claims that Putin actually owns 58 aircrafts, including a Dessault Falcon that seats 19 and costs more than $45 million (the price for a 16 seater). Another one of his planes is rumored to have an $11 million cabin fitted out by jewelers and a toilet that cost nearly $100,000. This plane seats up to 186 passengers. Putin reportedly owns five of these. Further information in Boris Nemtsov's dossier claimed that Putin owns four yachts. One of his yachts was upgraded in 2005 at a cost of $1.2 billion. He also owns a yacht called "The Graceful," which has six bedrooms that can sleep up to 14 people. Putin also received the $35 million, 187-foot luxury yacht "Olympia," as a gift from billionaire oligarch Roman Abromovich. Nemestov's 2012 dossier also claimed that Putin has a taste for expensive watches and owns 11 of them worth about $687,000. "Russia Beyond the Headlines," a Russian government owned newspaper claims that Putin owns an A. Lange & Söhne Tourbograph Perpetual 'Pour Le Mérite. That watch's value is $500,000. In July 2017, a $1 million Patek Phillippe watch went up for auction. The documentation for the watch listed Putin as its owner. Unsurprisingly, the Kremlin denied these claims. Vladimir Putin is also reportedly a clotheshorse. Newsweek writer Ben Judah researched the Russian President for three years for his book. Judah said Putin is all about designer suits and Valentino ties over any other clothing. His suits are mostly by Brioni and Kiton and custom made for $5,500 and up. 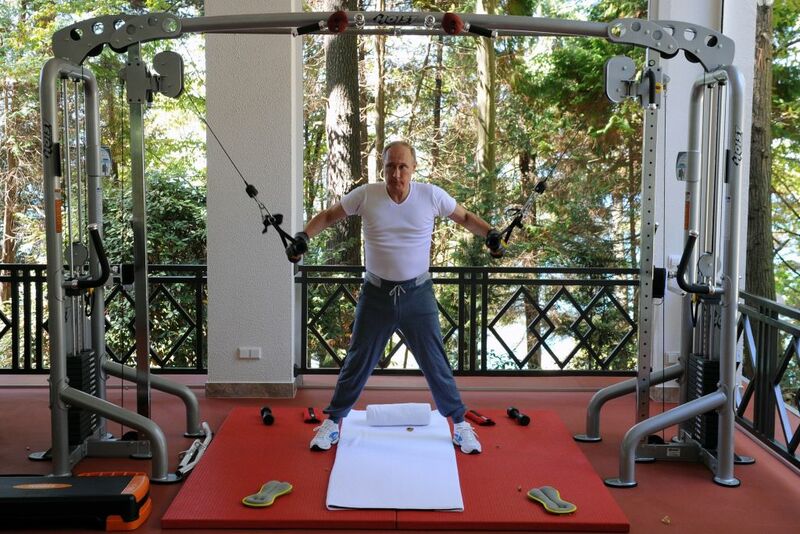 In 2015, Putin was photographed working out. We've used that picture for this article. His silk and cashmere blend sweatpants and shirt cost $3,200. And all he was going to do is sweat in them. That makes the $100 price tag for a pair of Lululemon leggings look small in comparison. Why can't anyone pin down a near estimate of Vladimir Putin's net worth? All signs point to his inner circle. He uses proxies like his best friend Sergei Roldugin and banker Yuri Kovalchuk to hold his wealth. The Panama Papers pointed out the fact that Putin's closest friend and advisors have earned millions that would not have been possible without him. Of course, the Kremlin denies that Putin has used his position as President to make himself and his friends richer. "I am the wealthiest man, not just in Europe but in the whole world: I collect emotions. I am wealthy in that the people of Russia have twice entrusted me with the leadership of a great nation such as Russia. I believe that is my greatest wealth." We may never know how much Vladimir Putin's net worth is. At Celebrity Net Worth we estimate is at $70 billion.